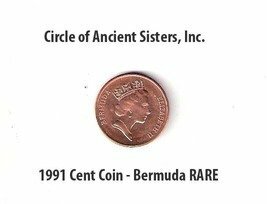 Very Rare 1991 Bermuda 1 cent coin. Obverse: BERMUDA ELIZABETH II - Profile of Queen Elizabeth, crowned, facing right. Edge: Plain Condition: Beautiful! (Looks Brilliant and like Uncirculated.. The Parliamentary British Colony of Bermuda. Bermuda is located in the Atlantic Ocean. To the west is the American state of Georgia, and to the south is the Caribbean Sea.